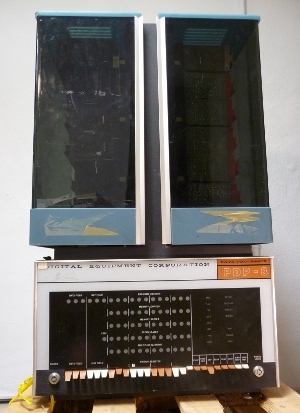 This is the first model of the PDP-8 computer line which was the successor to the PDP-5 and was made between 1965 and 1968. This computer's serial number is 184, processor backplane serial number is 217, memory backplane serial number is 202, and the core memory's serial number is 84. A total of 1450 of this model PDP-8 were made. The core memory module has a manufacturing date of the 1165 which I think is the 11th week (March) of 1965 but could be November 1965. The latest date on a component that wasn't obviously replaced or installed later was the 12th week (March) of 1966. The Extended Arithmetic Element (EAE) option boards are dated 1967 so were likely installed later in the machine's life. The computer is made with discrete transistors on R and S series logic and G series special function boards. It was probably used at the University of British Columbia in Canada. When I got it the arrival and initial inspection showed the computer had some minor damage but nothing obvious that should prevent restoration. I have now started the careful disassembly, cleaning, checking, and repairs needed to bring it back to life. If your looking for more information on PDP-8 and Teletype restoration see The University of Iowa's Straight 8 restoration. The computer weighs about 180 pounds total with the power supply in the base around 60 pounds of the total weight. The computer draws about 400 watts running disk monitor system. It came with a DF32 32k word disk drive that looks like the other ones I have. It also appears to be in reasonable shape. Its serial number is higher than the one I have in my 8/I so it may have been purchased later than the computer.